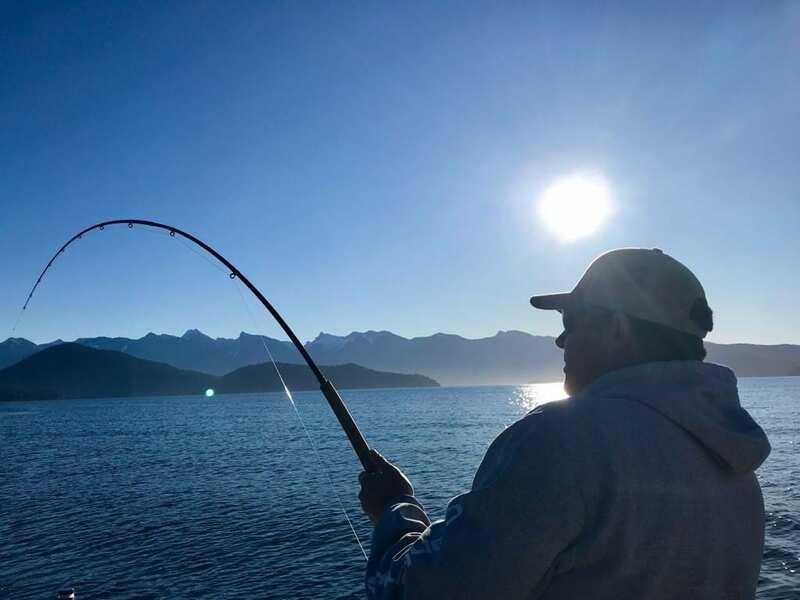 Sun and mid-teens weather, the fry are popping, bulltrout and cutts are out in force, steelhead are biting and our guys are catching good numbers of chinook, crab and prawns out on the saltwater – what could make it better? A sale! Our Spring Super Sale is almost HERE! You have probably already seen all sales list on Instagram, Facebook or on the blog but this weekend; Saturday and Sunday the entire store is on sale! It is the biggest sale of the year but only lasts two days! So be sure to come on down and get geared up for less! If you are hitting the water this weekend after checking out the sale don’t miss this week’s reports. We have had great reports from all our major fisheries. We won’t bore you with the details here so scroll on down for the latest intel from the water. In case you missed it yesterday our full sale list is out. Check out the full list here and don’t miss on a weekend full of savings! April is almost upon us and so is a great lineup of spring classes. Well we did get a bump of water like I promised in my last report. It wasn’t a huge fluctuation but it was enough to give some of those dormant fish a kick-start into being a little more bite-y and we have heard some good reports that have backed this up. 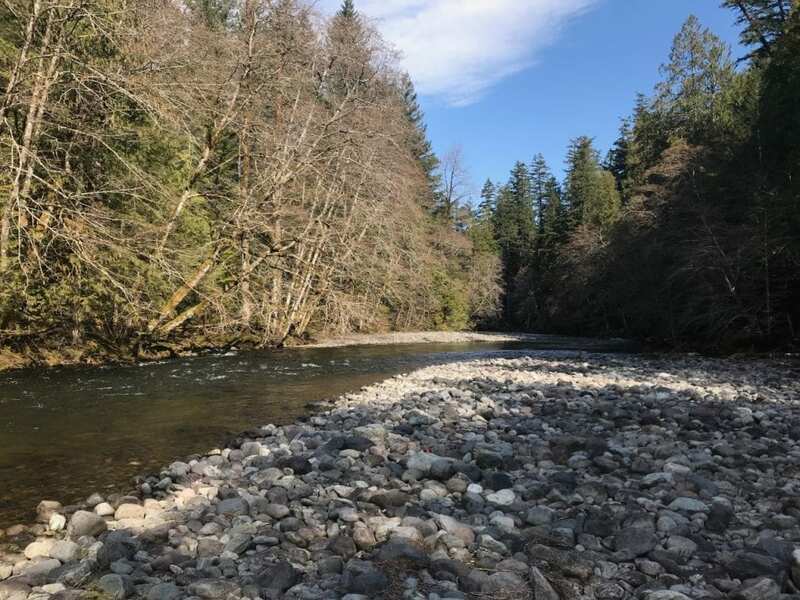 With more adequate flow now we should see some more Steelhead coming into the system and as we get into the latter half of the season these are the fish you want to target, as they will still be clean, silver fish. 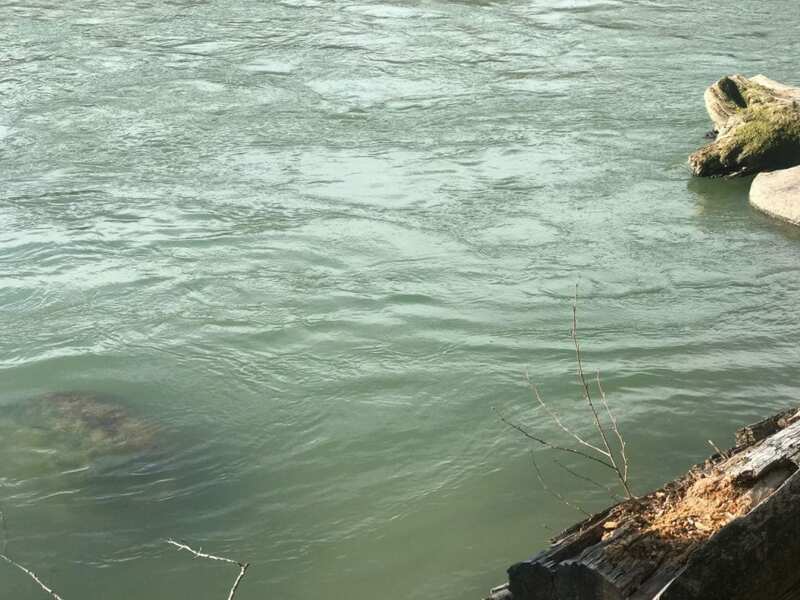 This does mean that you will want to think about staying a little lower down on the river; not to say you won’t catch clean fish up top but you will be more likely to pick up a spawner. Sean with a beautiful Vedder wild, assisted by Charlie. Good boy, Charlie! We have about a month left to the season before most of the river closes and becomes fly fishing only from the Crossing Bridge down. 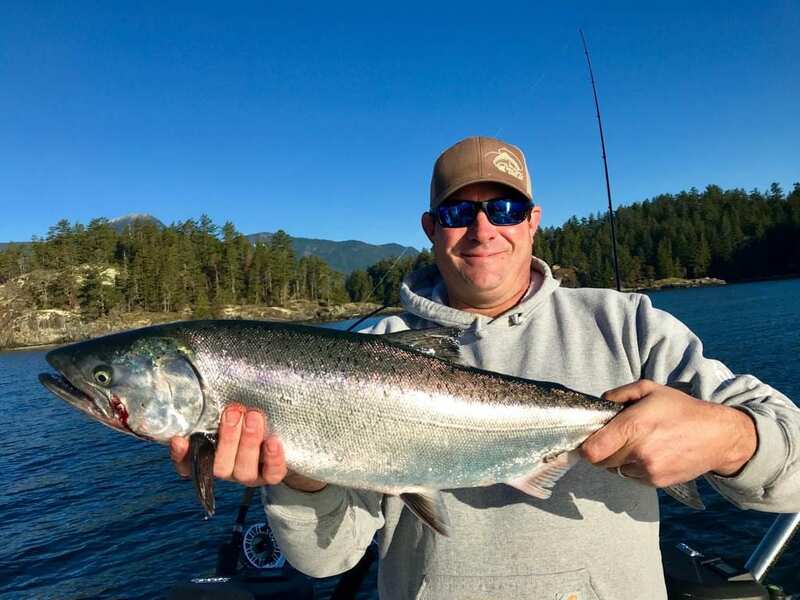 If steelheading has been calling your name all winter then this is the time to get out there before it’s too late. The Squamish has been interesting over the past week. 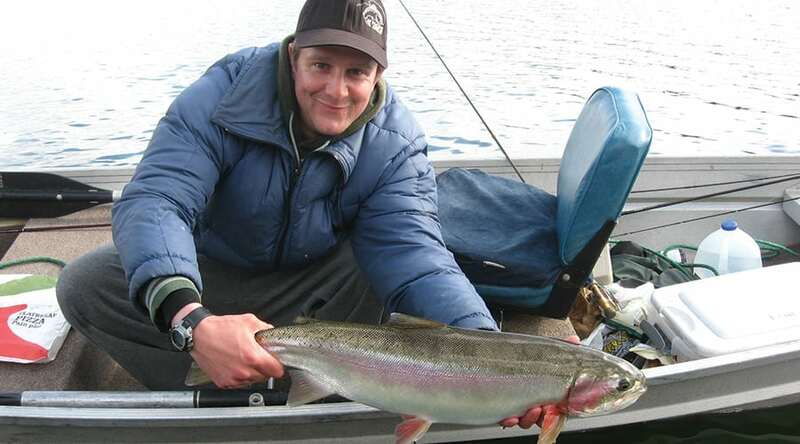 Steelhead, bulltrout and cutthroat are being caught throughout the system. You will really want to put the miles on and fish as much water as possible as quickly as possible. I took Aidan out a few days ago and we covered a lot of water. The reason for doing so was to obviously find fish but to also beat the changing water conditions. The evenings are still a bit chilly but we are seeing some really warm temperatures during the day and this changes water clarity throughout the day. In the morning we were fishing an area that had a touch of colour to it, which was great. We were able to fish any colour and size of fly pattern that we wanted. As we walked back to the car from the first area that we were fishing I noticed a significant change in the water conditions. Things went from a touch of colour to maybe 4 feet of visibility, which is still good, but it was a far cry from where we were when we first got to the river a couple hours earlier. As you can see the water colour changed throughout the day. We then traveled to a second location further up and we were greeted with crystal clear water and very low conditions, which made for challenging fishing. 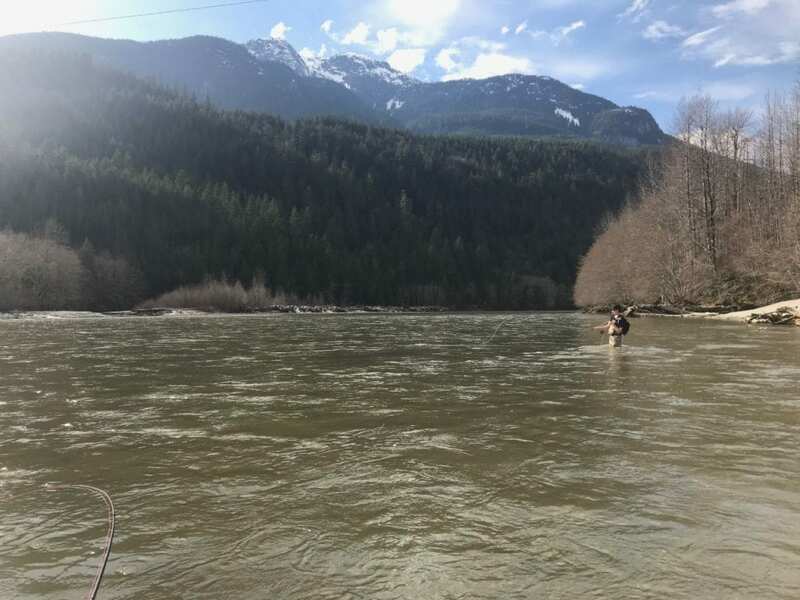 Our third location was on the Upper River and we did see quite a few anglers around so we decided to find another spot to fish but the water was still about the 4-5 feet of visibility. As we traveled to a fourth location we had the AC cranked in the car, as it was 18 degrees outside! Our next spot was on the lower river and as the temperatures continued to go up the water continued to colour up until it looked like chocolate milk. We fished 2 spots on the lower river in the hopes of getting some fresh fish on the flood tide. Unfortunately, this day wasn’t our day as was the same with other anglers that we spoke to throughout the day. I fished the same pattern all day as I usually do when I am chasing Unicorns. I like to pick a pattern that I have confidence in and fish it well. Also, the less time you waste changing flies, the more time you can spend fishing. 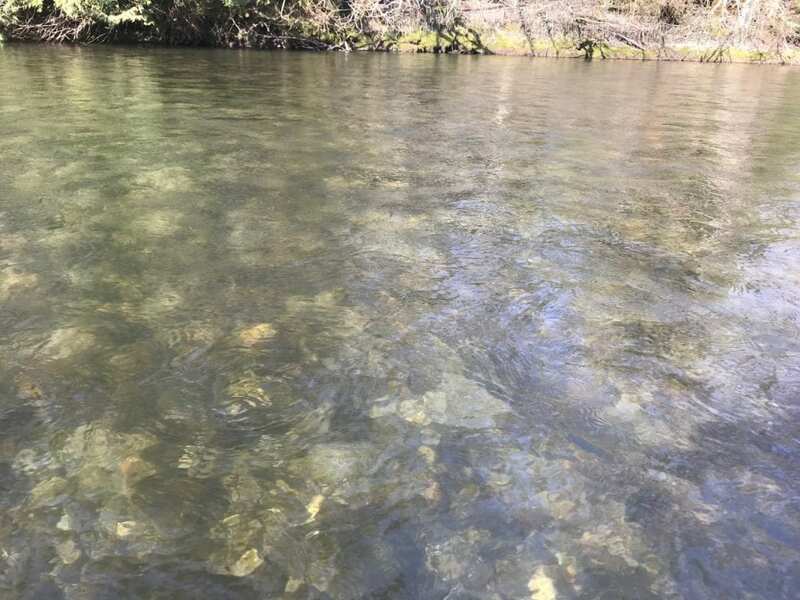 Aidan started off smaller and a little more muted in the day with his fly selection and as the day progressed and the water conditions worsened he started to go larger and darker with his pattern selection. When the water gets extremely dirty it’s best to have a fly that will contrast with the water colour as opposed to blending into it. On the fry front we didn’t see any on our travels, which was a bit strange as we literally travelled the entire system. I am sure they are around and the water conditions would have made it tough to see them as the day went on. If you are chasing the cutthroat and bulls I would start the day with a longer leader and the skinnier fry patterns. As the day progresses and the water gets dirtier then switch over to a shorter leader and the fatter fry patterns. For this weekend it looks like we are having the same kind of weather pattern so I would focus on getting to the river as early as possible and progressively changing your presentation to match the water conditions. 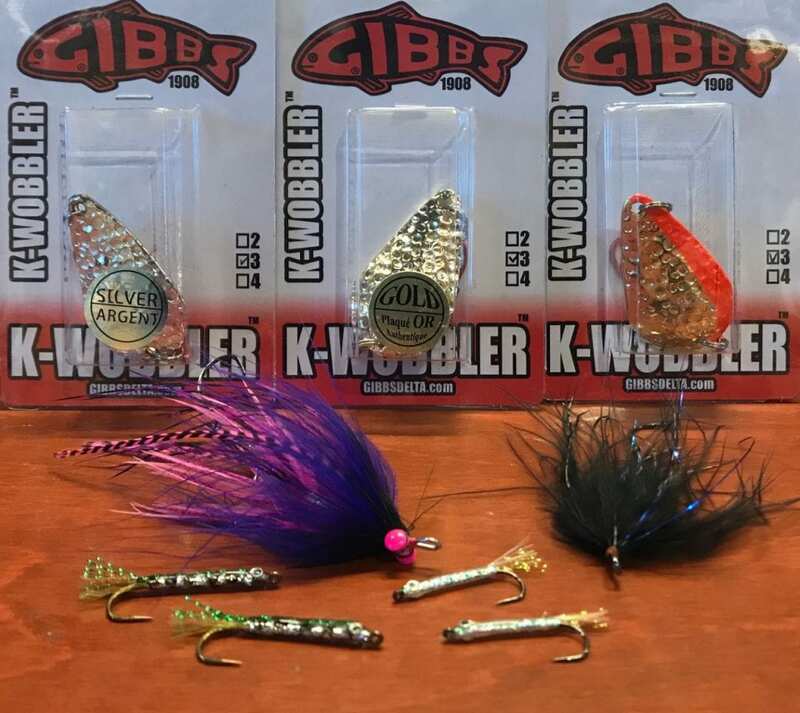 Jigs have been producing fish for the gear guys, as have spoons, like the K-Wobbler. For flies I would start with Pink Intruder style flies and continue to get darker with your colour selection as the day goes on and the water conditions get worse. My choices for the day! Good luck out there and we are looking forward to seeing you all in the shop for the sale this weekend! We’re finally seeing a bump in water levels on the Harrison. Prior to this week, the river was nearly crossable in some areas. As usual with the searun cutties, we’ve been getting mixed reports from the system, ranging from dynamite days to fishless daydreaming with the common denominator being whether you can find the fish or not. Although much of the system is purely based upon “hunting” down the cutties, your fly selection can truly be a game changer. We have a vast selection of fry patterns based almost purely upon the Harrison system, with the common pattern being a skinny fry with a chartreuse back. Remember, you can have successful days on the Harrison without even getting your boots wet, due to the fry being pressed up into shore. The weather looks beautiful for the next week, so if you’re planning on a bit of an excursion, give a bit of a look towards the Harrison. 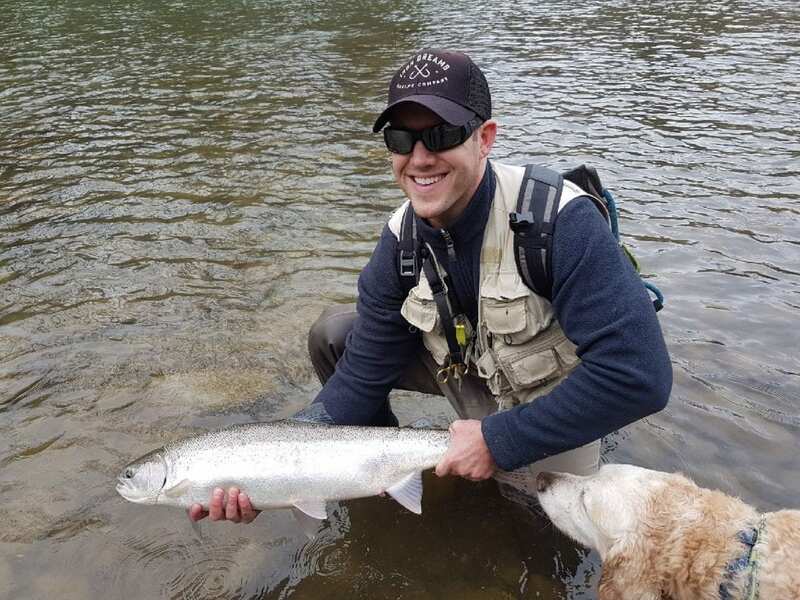 The Stave River has seen some anglers targeting cutthroat find success. 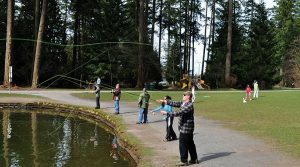 Lighter rods and fry patterns are the norm for most anglers at this time of year, but some do search for steelhead. Whether you’re using flies or gear, it is important to cover water and have a selection of presentations. Be aware that they can sometimes release water from the dam and that you should keep an eye on water levels if crossing channels. One other offering that gets overlooked is nymphs. Both fly anglers and even drift anglers should have a few of these in their kit regardless of targeting trout or steelhead. If you’re curious to know how much your fish weighs, just remember that most of them come with their own scales. 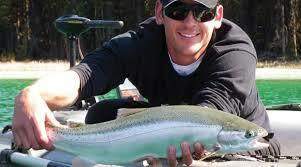 Well the cherry blossoms are out and that means spring time chinook fishing is here. This is the transition week where more fish start to show up “out front” and by that I mean the QA Marker, South Bowen, Hump, and around the Bell. I mentioned this in last weeks report and we saw fish caught in all those spots this past week. Greg hooked up on a decent fish! There are still feeders well up into Howe Sound as well, so it is really a tough call where to go. The “out front” spots usually start to produce better now and things will really pick up in the second week of April, so that is where I would focus my efforts. 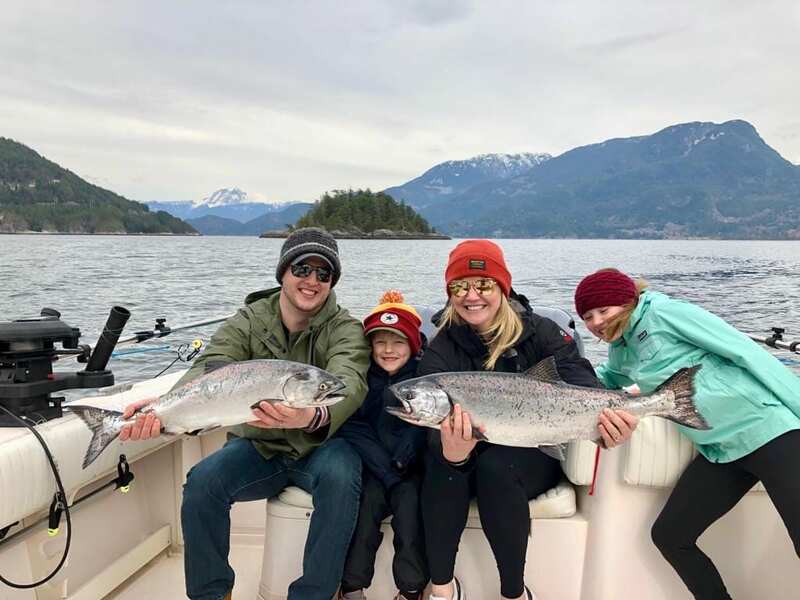 Derek’s guests with a couple of nice ones from Upper Howe Sound. Speaking of picking up, it did just that on Thursday in the harbor with some great catches around the Bell and the Freighters. Seems like the chinook finally found all that bait that has been in there for weeks, so lets see how long they stick around. This could be that wave of chinook that we normally see target those herring about mid March, so it looks like they are about 7-10 days late this year. Best depths have been on bottom to about 30 feet off bottom with chartreuse glow flashers and glow green spoons or glow green teaser heads. 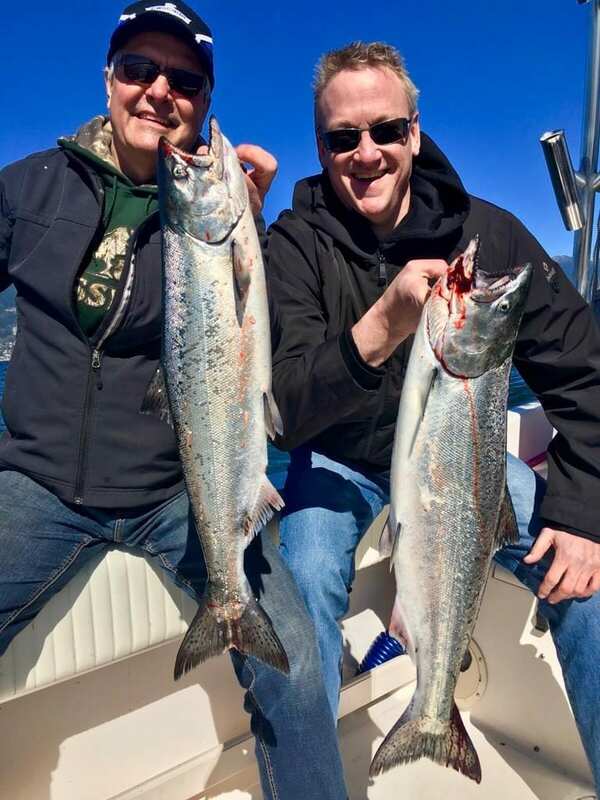 Eddie’s guests with a pair of chinook from the freighters. So there are lots of options for fishing this weekend and the winds look like they will let you go wherever your heart or fuel bill desires. If you are going to try off South Bowen or the Hump, productive depths have been 90-150. Even Thrasher could be a good bet this weekend. So get out there and enjoy this forecast and get fishing. You can even do a combo day like we did on Wednesday. After catching a nice chinook in the morning it got a bit windy so we went up the Fraser and got a couple sturgeon. So many options right now! Greg with a nice hatchery from Lower Howe Sound. 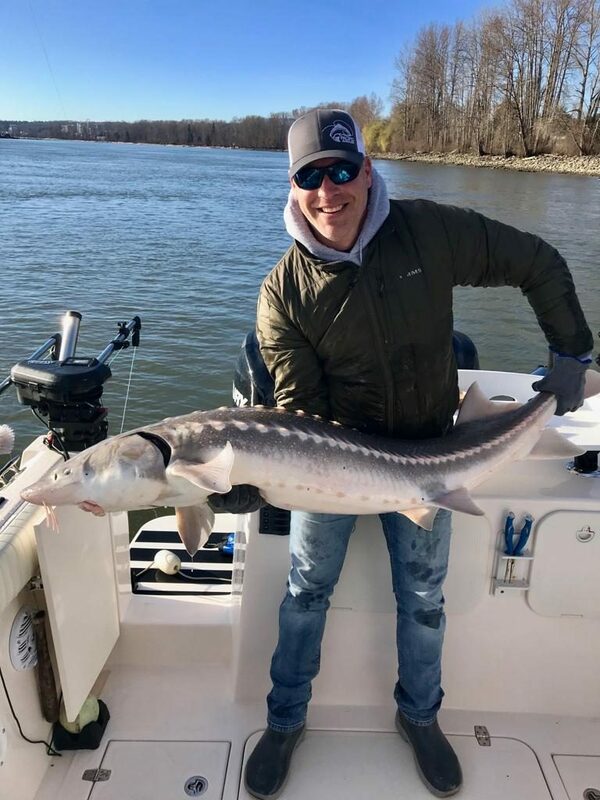 Jason with a Lower Fraser sturgeon. Also note that we haven’t heard any updated information about the chinook fishery, just waiting for the Minister to make an announcement. As soon as we find out something or the announcement is made, it will be posted on our Instagram and Facebook pages.